Whether you got all excited and began making lampwork beads last month, or if you've been making them for a long time, you know that they begin to pile up fast! 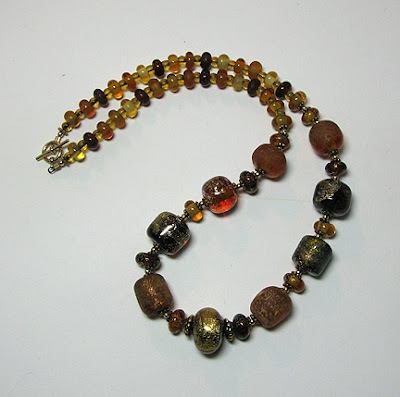 You can never have too many suggestions for how to use them, so I gathered up a few of the easiest necklaces that I make using my own beads and have taken some shots to give you just a few super-easy ideas for stringing or wiring your own beads. 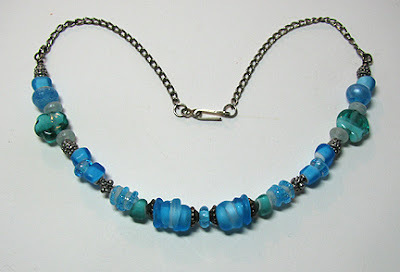 The necklace at the top of the post uses a lot of lampwork spacer beads along with a few larger focals. Between each bead in the focal section, a small metal round and some metal daisy spacers keep the beads well-centered on the beading wire (I use SoftFlex). In the upper sections near the toggle clasp, the lampwork spacers alternate with round 4 mm glass druks. For this necklace, I slid all of the lampwork beads along with metal spacers and bead caps onto a length of 18 gauge sterling silver wire. I made a wrapped loop at each end, around a length of chain. You can gently bend the wire into shape for your necklace. Lampwork beads often have holes that are large enough to accommodate stringing materials other than beading wire or thread. 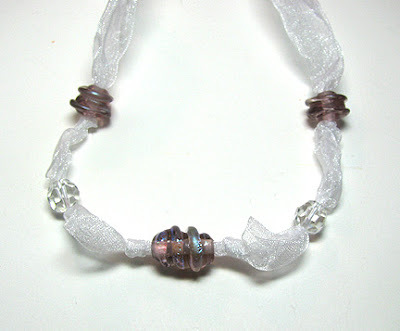 Here I used an organza ribbon and slid them on along with a couple of vintage crystals. A loose know on each side of the beads will keep them from sliding. 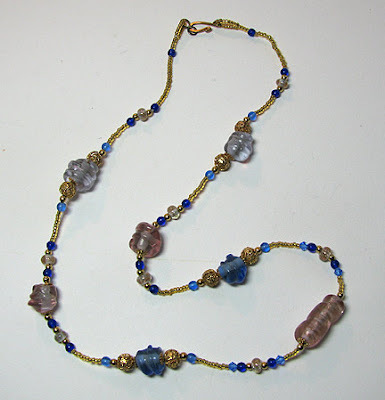 This necklace was also strung on beading wire, like the first one. Instead of having a solid strand of lampwork beads, I used size 11/0 gold seed beads to space out the clusters of beads. Lovely - every one of them. Thank you for sharing, Cyndi.